This forged sterling silver ring features a white sea glass orb found off the shores of Saint Martin. The orb has an air bubble trail that goes 1/4 inch deep inside. The orb is set in a sterling silver bezel that has been fused with wave design. This is suspended on a sterling rod that is capped with two 4mm Black Onyx which also spin when the orb spins. 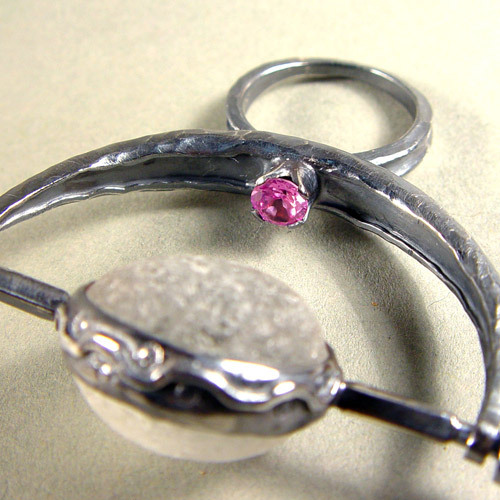 The 5mm lab-created Pink Sapphire is set in a hand drawn tube that I carved out prongs. I used hard solder except for the prong setting which i used medium because i was afraid of melting it because the horn is large heat sink. Sea Glass Divining Ring. On the full moon when the moon reaches apogee the ring held high above the wearers head..The orb is spun. After it stops spinning, wave your hand over the earth and when the sapphire and orb glow brightest that is the spot to dig for treasure. Weird thing is I unintentionally cut my thumb and blood spilled on it while it was hot...so one could say it was quenched in blood.